We are always on the move, this is a definite in life. Where we travel too is the one and only variable here, but have you ever stopped to consider that the comfort we have in getting there is instrumental in setting the mood for when we arrive? Shoes, we all wear them, but shoes come in all shapes and sizes fitting for various different activities, but what if you simply just want a pair to walk in and feel good in doing so? Finding the right pair of walking shoes can be a difficult task for anyone not in the know, so much so that we can almost guarantee that around 70% of men who buy shoes with the intention of walking in them aren’t happy with their purchase after trying them out for themselves. See the best walking shoes for women here. 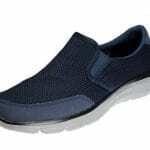 View the Best Walking Shoes For Men, Below. Will they have Shoes in my size if I have Bigger Feet? How long do Walking Shoes Normally Last? What is the Difference Between Driving and Walking Shoes? Not everyone is going to be able to find the time to properly research the best walking shoes available, which is why articles such as this one exist, to give you a varied selection of options to choose from! View The Best Walking Shoes For Men Below. 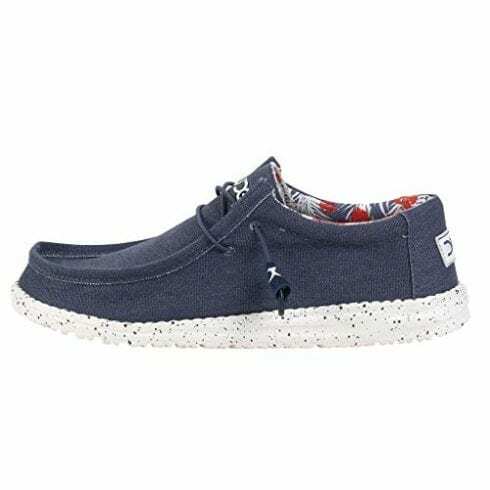 If you find that style is something that you take into consideration when it comes to your choices of shoe, then with the Skechers Equaliser Persistent Slip-On , that you have various different color options to choose from, all of which keep the shoe very casual, perfect for someone looking for something not too outlandish. The shoe's sole is made from rubber, with the outer and inner materials coming together for a very easy slip-on fit. The design of this shoe is very simplistic, one that can go with various different styles and looks depending on what your preferences are. Skechers are an incredibly reputable brand, one who are as reputable as they are affordable. The simplistic nature of the shoe allows one to wear it with any combination of clothing, coupled with the fact that they are incredibly easy to slide into and walk in. Our first lace-up pair of shoes on our list, the New Balance MW877 Walking Shoe is one of the more extensive walking shoes on the market. A little bit more expensive than the first entry in our list, but very different in that the sole of this shoe is made entirely out of rubber. Not only that but the heel-type of the MW877’s are of a low-heel, which does emphasize the full weight of your foot rather than just the ball of your heel. 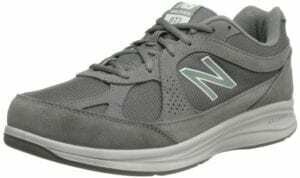 New Balance are experts when it comes to sneakers, meaning what you have here is a sturdy walking shoe that will stand the test of time over multiple environments. Although only available in one color, the shoe is incredibly comforting to walk in, allowing you to walk for long stretches without issue. 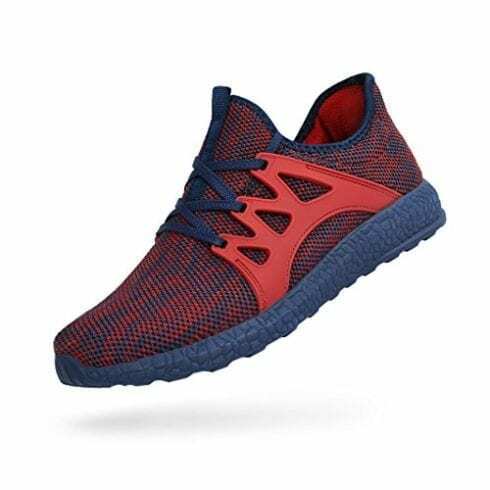 A shoe more fitting for the more active of you out there, the QANSI Lightweight Walking Gym Shoe is very useful in that it can be used for various different functions as its name suggests. The knitted mesh material used in the upper part of the shoe allows for breathability, letting your foot gain air as you move around, this also allows your foot to remain dry and cool as a result. A cushioned insole allows you to move around effortlessly, useful for gym environments where weights are used within exercises. Sometimes walking just isn’t all you need a pair of shoes for, which is where the QANSI pair come into the conversation. These are top quality gym shoes in their own right, it just so happens that they’re good walking shoes too. Available in two colors, black and white, New Balance ’s Men’s MW577 is a very well-crafted shoe that is not too dissimilar to that of the other New Balance shoe featured in our list here, the differences lie in the materials used and the price point outstanding. Where the MW877 used fabrics in its material, the MW577 uses leather, which does make it more resistant to water. The New Balance logo is embroidered within the side of the shoe, which is yet another great touch. 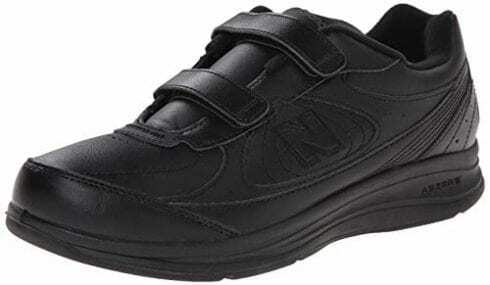 Again, these are lace-up shoes from New Balance, fit for the walking man. Leather walking shoes are incredibly useful for many reasons. New Balance created a very comforting shoe here, one that’s price point is a lot cheaper than its counterpart featured in this list. When we think of Rockport, we think of one word: durable. The men’s Eureka Walking Shoe is an example of innovative design, made specifically for the comfort of the owner. Made with genuine soft leathers for added comfort, this shoe has been engineered so that it flexes with your foot as you go about your day as normal. The outside of the shoe is made with a synthetic material that keeps the leather in place, keeping it very sturdy in the process. These shoes are impervious to outside damage and the like, perfect for walking across potentially hazardous terrain. Rockport’s are notorious for their durable nature, with this shoe falling no different. If you are someone who lives outside of a city and likes to walk, then these shoes will be for you. Somewhat of a hybrid of the previous two New Balance offerings that we have in this list, the MW411’s are fit for most occasions involving a lot of strenuous movement. 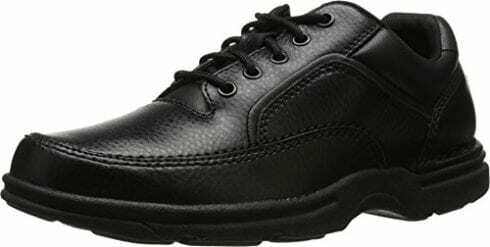 This lace-up walking shoe has been made to do simply that with a very simplistic design, despite retaining all the levels of comfort that you've come to expect from a brand the likes of New Balance. A gum rubber sole allows one to easily navigate surfaces no matter where they happen to be. One of the more durable shoes in our list here, the MW411’s are great in any environment and are reasonably priced also. 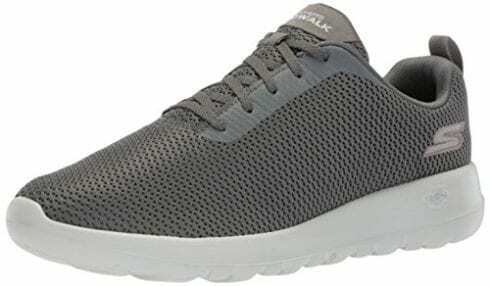 The Men's Go Walk 4 from Skechers is a very innovative shoe, to say the least. The benefits of this shoe come with its lightweight performance, coupled with the fact that they do not lose any comfort despite being so light. Again, this is a slip-on shoe, meaning you can essentially throw your feet in them, and away you go! The inner material is made from a synthetic fiber that retains the quality of the shoe despite any wear and tear. 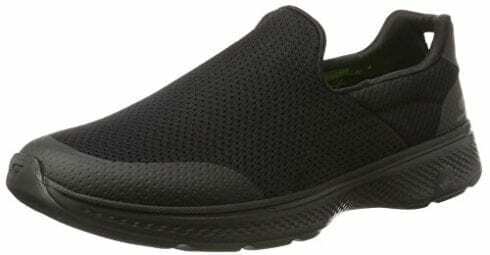 Skechers have managed to craft an excellent lightweight alternative here, one that feels like a breeze to move around in, perfect for those who are maybe weighed down slightly by the size and weight of their shoes. Our one and only Clarks shoe comes in at no.8. Quality is the name of this particular shoe since it is handcrafted and comes with a list of additional features. The heels of this shoe are flat, which shouldn't pose as too much of an issue to those who simply care about the inside feel of the shoe with their foot within it. Of course, this is a slip-on loafer, so comfort was never going to be an issue from this leather shoe. You can have this shoe in a mix of oily and non oily in both brown and black colors also. Clarks were going for a more business casual sort of shoe with this particular one. You could wear these shoes for most occasions with no faults. When we think of nothing but comfort, then this shoe instantly comes to mind. This shoe is made from a stretch fabric, which allows you to easily get your foot in and out of this shoe without any issues at all. This is a lace up shoe, but we see no issues with you simply placing your foot into it with them already tied given the fabric used. The rounded toe is yet another great touch which only heightens your experience with this loafer outright. It can be easy to misconstrue this shoe as simply a slipper, but you can actually wear these shoes in a variety of different walking settings, although wet weather could prove to be an issue. Our final walking shoe here comes via the Skechers 54601’s. From just simply looking at this shoe, comparisons could be made between this and the many New Balance offerings listed. This shoe has been optimized for maximum comfort, having a lightweight frame and responsive 5Gen cushioning that only adds to the feeling of walking in these shoes, to begin with. The sole of this shoe is synthetic which could prove to be an issue when walking over certain terrain, but if you are going to wear these within a city of some kind, then they are perfect. The comfort is most definitely there with this one, so much so that we’d probably go as far as to say that it’s the most all-round shoe in our list here. A lot of what we have included in our list above can be very easy to misunderstand, especially if you don’t know what you personally want out of a walking shoe. All of the shoes listed above are relatively similar to one another in the materials used and whatnot, which can only add to the confusion. Allow us to add more context within this section of the article where we cover some of the things to look out for and why you should care about them outright. What separates walking shoes from other categories of shoe out there comes down to how you would use them in everyday life. 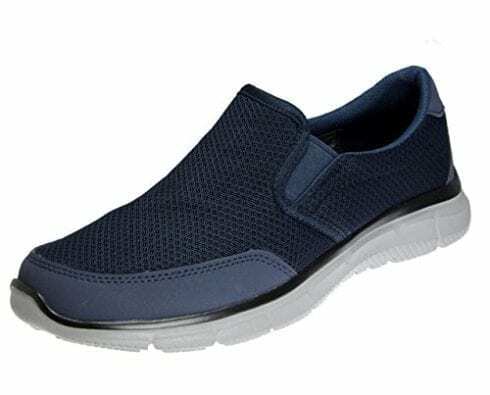 Like driving shoes, walking shoes aren’t meant for excessive activity (unless you purchase the QANSI Lightweight Walking Gym Shoe), they are simply there to add comfort in the simplest of tasks that involve walking short distances in dry spells of weather. Leather walking shoes will prove to be more durable here, although they will still store water no matter what. Knowing where it is you live, and the sorts of terrain/weather you face should be a good indicator in making a decision fit for you. If you live somewhere that is away from a city-like environment, then you might want to prioritize durability over comfort in the shoe that you choose. Cold weather could also prove as something of an issue, again depending on where you live and how often you would wear the shoes during daily activities. The biggest consideration to take into account in any decision here is comfort. It is pointless buying a product that is not going to last or retain its quality over time. Yes, an argument could be made that everything drops in quality over time, but some will last longer than others just based on the materials used and who happened to manufacture them. If you are ordering shoes online, then you are not afforded the chance of trying on the shoes as you would normally in a store, this can prove to be somewhat of an issue, especially if you are have never owned a pair of walking shoes previously, and are simply going off of the appearance of the shoe. Although appearances are important, it is fruitless buying a pair of walking shoes if you aren’t going to wear them out of discomfort. As you can see above, each shoe looks completely different from one another. This was a purposeful decision on our part to offer you some form of variation. We all have our own signature style, it’s shown in the way that we dress and the styles of our hair, so why should walking shoes be any different? Walking shoes are incredibly stylish despite their limited functions, which is partly the reason why individuals seek these forms of shoes over all others. With style, there is always going to be a rise in prices depending on the quality or look of a certain shoe. If style is important to you, then you might buy a shoe specifically because of the look of it, throwing to the wayside the comfort of the shoe as discussed above. We would advise you find some sort of middle ground that looks at both style and comfort. 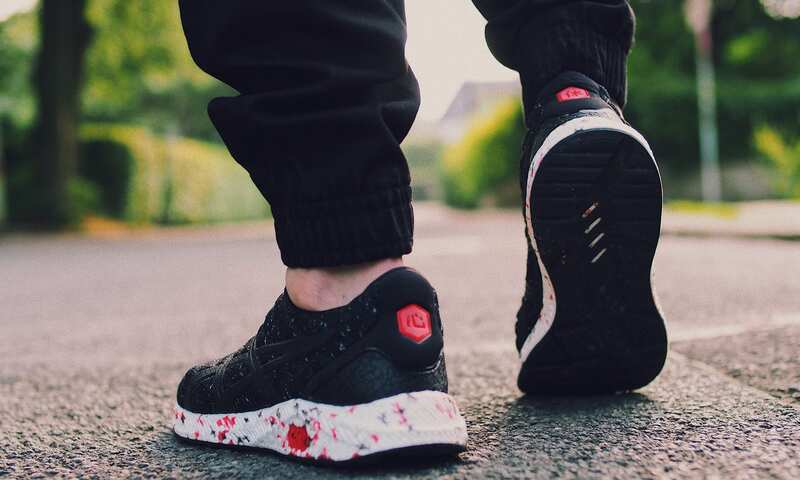 Most walking shoes nowadays are very stylish while retaining the comfort they promote; you need only look at any of the lightweight shoes in our list to see that come to fruition. If you happen to have bought a pair of shoes that are of a certain brand, then you should already have an idea on the quality of the shoe in question. We understand that a running shoe is completely different to a walking shoe, but if that running shoe is prone to wearing down easily, then who’s to say that your walking shoe won’t do the same? Especially if it is made with materials that aren’t as durable to the weather and whatnot. We would advise you keep the receipts of anything you buy, and keep in mind which brands have warranties on the products that you purchase. Walking shoes are intended for strictly walking (unless they say otherwise), but that still doesn’t stop people from exceeding their original functions without thinking about any implications/damage to the shoe. Just keep in mind that if your budget is an issue, then you might find that the quality comes in the more expensive shoes. It really is down to the manufacturer unfortunately as to whether or not they have shoes in a larger size if you require it. Most sizes are capped depending on the maker of the shoe, although brands such as Skechers and New Balance do accommodate to those with bigger feet who might not get the same walking shoe elsewhere. 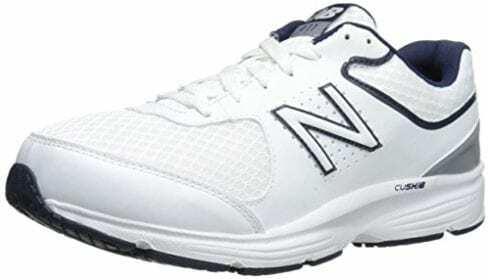 See more New Balance walking shoes here. This will depend entirely on where it is you are walking to and how well-kept the shoes are. We would advise investing in some sort of polish of some kind if the shoes are made of leather. If the shoes are made of a material, then extra care should be taken to make sure that they do not break down over time. Knowing where you are walking to and from should give you an idea on any obstacles that could wear down the shoes that you are wearing/thinking on purchasing. The differences between the two come within the quality of the two shoes. Driving shoes will often have little to no sole on the bottom of the shoe, instead of using rubber studs that add to the comfort/movement of the foot within the shoe. With walking shoes, durability is taken into account, meaning the material of the shoe is made sturdier, as is the sole to make for a much more supportive fit, safe for walking distances. Walking is good for your health and overall mental well-being, and having the perfect pair of shoes is always going to add to these benefits as a result. No matter your age, it’s hard to disagree with the fact that comfort is everything when it comes to activities such as walking. Don’t take yourself for granted, purchase a pair of walking shoes that work for you and never again will you look back in frustration. There should be no excuses as to why you don’t own a decent pair of walking shoes, especially if you are walking long distances on a regular basis, think of yourself! 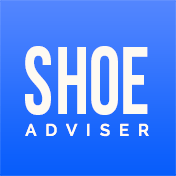 Make sure that with any shoe you purchase there is at least half an inch of space between the tip of your toe and the end of the shoe. This will allow you to move your foot around a lot easier when inside the shoe. Wear socks also! Otherwise, risk having some awful smells come from the shoes. Walking shoes are ten times less likely to give you blisters and calluses on your feet! The shoes utilize fabrics that hug your feet in a certain way that causes your feet to simply move around them freely rather than cause friction against the back of them as you walk. Walking shoes are used in the medical world also, assisting those with arthritis in their feet given how comforting the shoes happen to be in their own right, this is also the reason why foam is used within the shoes insole. 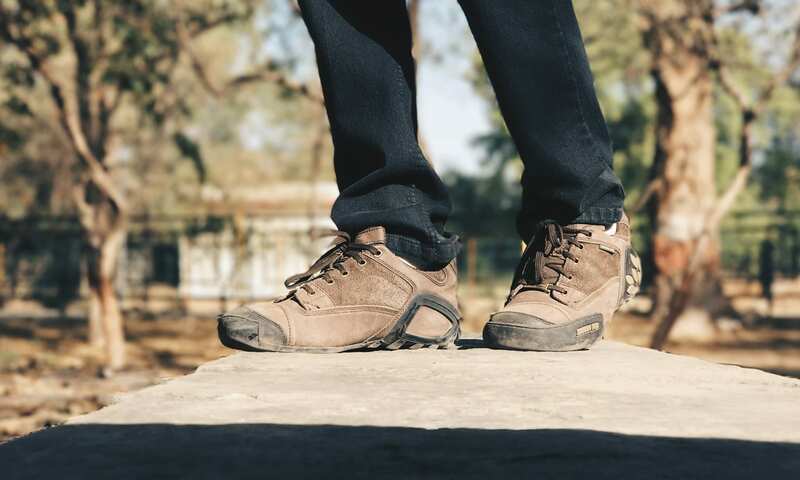 We hope you enjoyed our article on "10 Best Walking Shoes For Men in 2019", if so, please share and rate it.